Despite his attempt to finish off Sherlock Holmes and move on with his career as a writer, Sir Arthur Conan Doyle had started something that would become much bigger than himself. After he cast Sherlock off a waterfall to his death in 1893’s short story “The Final Problem,” Conan Doyle couldn’t keep Sherlock dead very long. Popular demand and the promise of mountains of cash motivated Conan Doyle to officially bring Sherlock back to life in a series of short stories between 1903 and 1904 that would be published as The Return of Sherlock Holmes in 1905. Sir Arthur Conan Doyle, when he created Sherlock Holmes, stumbled upon a character that resonated deeply with the readers of his day and that we still find enormously compelling in the 21st century. What is it about Sherlock that continues to captivate us? According to Sherlock Holmes himself, the way to solve a mystery properly is to gather all the data first and then deduce a conclusion in order to avoid twisting the facts to support your prejudgment about what they might mean. In this way, Sherlock sounds like the ultimate hero of modern science who knows how to chase down cold, hard, unbiased objective truth. But the problem with this is that we can’t help but theorize before we have all the facts. So in spite of himself, I think there’s more to Sherlock. Part of what makes Sherlock Holmes so enjoyable is that a mystery plays with our intuitions and prejudgments. We often begin trying to make sense of the story with an idea or an intuition of what we think might have happened and why. As the story progresses, our intuitions are tested against the clues and are either confirmed or discarded. As all the pieces fall into place, we understand what happened more completely and more clearly than before or, if we’re really good, our intuitions are confirmed. In a certain way, when we let ourselves enter into a mystery, we discover our own prejudices and biases as the story unfolds. Maybe the reason we enjoy a good mystery is because it is an exercise of self-discovery that unearths our presuppositions. What I’ve just described is beginning to sound suspiciously like how Hans-Georg Gadamer describes the hermeneutic circle in his book Truth and Method. Drawing on the work of his mentor Martin Heidegger, Gadamer explains that all of us go into a text with an idea about what it says, or a prejudgment of what we think we will find there. So if you want to really engage with a text, as you work your way through it you begin to replace your prejudgments with ones that are more faithful to what you actually find written (Truth and Method 269). Without this sort of prejudgment, though, you wouldn’t know where even to begin your interpretation of what you read. So in a weird way, our biases help us understand texts, as long as we’re open to the possibility that we might be “pulled up short by the text” in a way that challenges those initial biases (Truth and Method 271). The challenging of our prejudgments forms a circle in which we initially interpret a text in terms of our prejudgments, are pulled up short by the text itself then rethink our prejudgments. And then we go around again and do the same with our new or modified prejudgments. So it seems that Gadamer would say that Sherlock doesn’t have his own method quite right; we have to theorize before we have all the facts because we couldn’t make sense of the facts without a theory to measure them against. 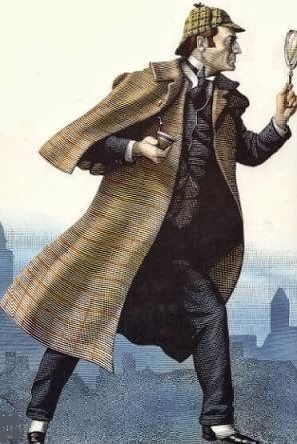 So I think a good Sherlock Holmes mystery will always be a satisfying hermeneutical challenge for us as readers or viewers. We bring our prejudgments to the clues we meet at the outset, and Sherlock guides us through a process of confirming or discarding these prejudgments as we discover more clues, a process that allows us to come to realize either the brilliance of our intuitions or the unreliability of our biases. This seems similar to Gadamer’s hermeneutic circle: we go in with a prejudgment, examine the clues, then rethink our prejudgment by confirming, discarding, or modifying it. We do this again and again until the pieces start to fall into place, and the facts begin to come into focus. Just as each new case for Sherlock Holmes functions like a text that calls for interpretation, each mystery for us is a text that invites us into an exercise of hermeneutics. As Sherlock unearths clues and draws conclusions, he pulls us along with him as he reveals and conceals information, and guides us through a process by which we are able to measure our prejudgments against the clues of the case. So perhaps Sherlock is not just a hero of modern science, armed only with the powers of reason and deduction; he is also an instructor in the art of hermeneutics. Before we proclaim Sherlock Holmes the hero of hermeneutics, however, we should notice an important difference between Gadamer’s hermeneutics and Sherlock’s deduction. Sherlock thinks that considering all the data lets him get to the bottom of what really happened, whereas Gadamer might not be so optimistic. Gadamer sees the process of interpretation as infinite; we never definitively get past our interpretations to the bottom of a text. Sherlock, on the other hand, wants to nail down the reality behind the clues. While Gadamer’s approach does require us to let go of this notion that we can get reality nailed down, it doesn’t make detective work obsolete. The hermeneutic circle still allows us to move toward more suitable interpretations and draw reasonable conclusions. So Sherlock's work is not simply cold, hard deduction from the facts as he says it is; it is applying hermeneutics to the clues. And as Sherlock performs hermeneutics we are drawn into the mystery where we traverse the hermeneutic circle ourselves. Interesting post, Matt. Your last paragraph makes it sound like you're still nostalgic for something we never had and could ever get in the first place: immediate access to uninterpreted fact. The point is that we can't make sense of the latter notion, not that we must 'accept' that our interpretations must always fall short of securing such epistemological access, which if not for its impossibility would be desirable. We don't need to apologize for our finitude and particular situatedness. Hi Ron. Thanks for the comment! It seems to me that Sherlock is particularly guilty of this nostalgia for 'immediate access to uninterpreted fact.' But I think you're right that trying to nail down uninterpreted fact is a nonsensical pursuit. Perhaps I took Sherlock's side a bit too much. I do think it is legitimate to hold onto the sense that some interpretations are more valid or "more suitable" (as Gadamer says) and some are less so. As I see it, this suitability doesn't have to be measured against uninterpreted fact, but within a particular tradition, some interpretations might be considered better than others. This is what I was trying to get at the last paragraph; I wanted to leave room for conclusions to be considered valid even if uninterpreted fact is an impossibility. I also agree that we don't need to apologize for our particular situatedness, but I think Gadamer wants us to recognize the fact that our particular situatedness provides us with a point of view that does not give us objective access to reality. And so if we are pulled up short by a text because it says something unexpected to us, we are able to see that our point of view, because it differs from that of the text, is not the only possible perspective. Seems to me that theists LOVE the mystery genre which are ontologically fixed "whodunnits" that is, there is a actual WHO and an actual IT to have been done. Please pardon an old hippie from referencing, say "Blowup" where what happened is radically bracketed. Or for that matter the textuality of Doyle's Holmes which predate the codification of the mystery genre. Sherlock as presented in the text of the tales is often privy to information that the reader is ignorant of prior to the great reveal at the end. Doyle's actual storie are more about a secret gnosis that is known only by the intiates (i.e. Sherlock) They aren't stories that an armchair detective can "play along" at home (at Holmes). I don't know whether I should close by noting it's cute you're still reading Gadamer up in Toronto or by noting that Doyle was himself entirely convinced by photographs of the Cottingley fairies. There be no easy escape from presuppositions, methinks. Thanks for a scientist's perspective on this! Yes I do think there are parallels between the scientific method and the hermeneutic circle. I wonder if these parallels are part of what makes Sherlock an interesting case of hermeneutics. As long as scientific theories stay open and don't make claims about objectively pinning down our the universe, maybe Gadamer's view is compatible with thinking of the scientific method as a breed of hermeneutics. It's important to Gadamer, though, that hermeneutics is an infinite process, and it's never possible to arrive at objective facts. But there are differences too. I think Gadamer wants to say that interpretation is something that happens on a deeper level than just formulating and testing hypotheses. He thinks that we come preloaded with all kinds of biases and presuppositions that we probably don't even know about from what we have been taught (or just from the tradition or culture we are immersed in) that tell us what to expect the world to be like. So it's not that we initially form hypotheses and test them--it's that we bring our prejudices with us when we interpret anything at all. But for Gadamer, this is a good thing because we wouldn't be able to interpret anything unless we brought in some sort of prejudice--there would be no context for an interpretation to be relevant to us. Gadamer might be okay with saying that this is what makes the scientific method possible in the first place, but he might be uncomfortable with reducing hermeneutics to just the scientific method. I think he's wanting to point to something really foundational to what it means to be human. We're interpreting beings to our core, and the only way we are able to interpret is by having prejudices first. So while the scientific method shares some similarities with the hermeneutic circle, it's not exactly the same. What do you think? Does this make any sense? One thinker who has helped me to address Matt's final question is Bernard Lonergan. If I understand Lonergan correctly, what he termed the "transcendental method" is essentially the cognitive process that all human beings are wired for, and which, if followed authentically, leads us to objective truth, albeit limited in a variety of ways. The transcendental method, which underlies both the scientific method and the hermeneutic circle, is a cognitive process that is: being attentive, being intelligent, being reasonable and being responsible. It is not a static process, is ongoing, and is practiced most authentically in community. It is 'transcendental' in that it is the way in which human beings transcend our limitations in order to be more fully human, more fully our truest selves.